Ketut Madra enjoys the respect and honor of his peers as one of the most accomplished wayang painters of his time. His interpretations of Balinese legends are in collections on four continents, while his traditional work graces the family temples of his neighbors and the major pura of Pengosekan and Peliatan. From October 7 to November 7, 2013, 35 of Madra’s paintings, created over the previous 42 years formed the centerpiece of the exhibition at the Museum Puri Lukisan in Ubud, Ketut Madra and 100 Years of Balinese Wayang Painting. Designed as an introduction to the oldest form of Balinese painting, the exhibition attracted attention across Asia and Indonesia. Balinese artists also celebrated the exhibition, lauding its focus on the modern expression of this most traditional art form. The exhibition catalog, 64 pages in large format, includes high-resolution photos of all 69 paintings in the exhibition. 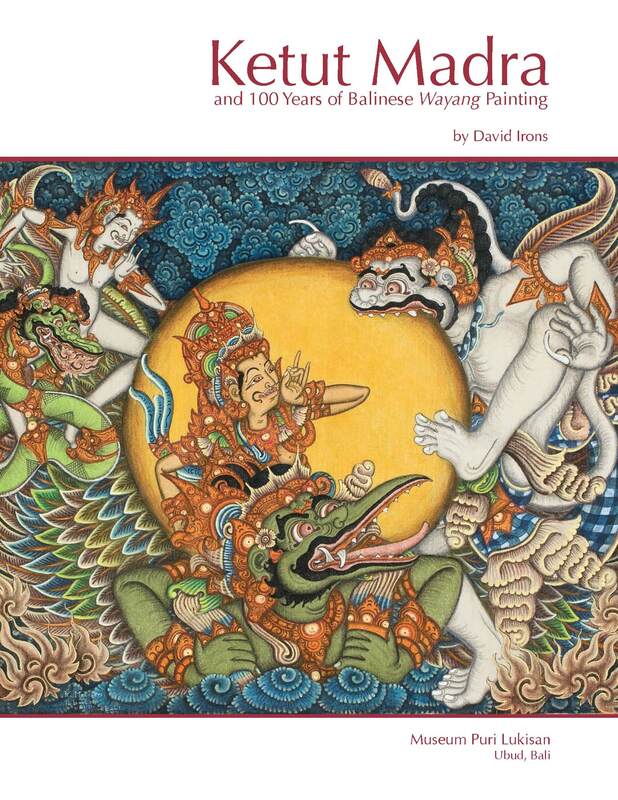 It also features essays on the recent evolution of wayang painting in Balinese culture and a six-page biographical note on Madra and his work. The catalog can be ordered here. Madra contemplating his mask before performing topeng tua. Sanghyang Aji Saraswati, Ketut Madra, 2012. Arjuna and Kresna in Battle with Karna and Salya, Ketut Madra, 2013. Ketut Madra (right) with Soemantri Widagdo of Ubud’s Museum Puri Lukisan. Madra in 2000 inking a naga (serpent) on an umbul-umbul, a banner used for temple festivals.